Warranty Processing, Inc. | Automotive Warranty Claims Administration. Interested in working for our company? Click here to learn more about open positions and availability. Outsourcing warranty could come down to a matter of survival. Now more than ever today’s automotive dealer must investigate all avenues thoroughly and secure all revenues due to the dealership. Warranty administration services are no exception, and there is no good reason to continue doing any activity in-house that can be done by professionals for less expense with larger returns. Warranty processing is an activity that creates distractions for little return, on the most valuable resource, time. Since the late 1990’s many of the nation’s more successful companies have been improving processes and profitability by determining their key business functions and focusing on them. They found that by eliminating and outsourcing certain skilled processes, like warranty administration, they became more focused on key profit related tasks and were better able to react to market changes. The service department in any dealership is an incredibly complex business that combines technical procedures and processes, building customer relations and trust, as well as warranty administration and relations with the manufacturer. Industry News : Warranty Trend Reports, hinder or help? Is there any benefit to the dealership, besides the obvious of avoiding a manufacture audit, in reviewing a warranty trend report? Can I actually use it as a tool to help my business? Or is it just a negative part of being a franchise and created to save the factory money at the dealerships expense? My hope is to demonstrate how there are some unintended benefits from taking an honest examination of your warranty processing trend that may actually help you create a better more profitable service department, not just improved warranty administration. 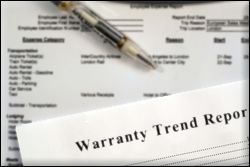 Warranty administration trend reports were originally designed in part to help the manufacturer pinpoint areas in which product quality was an issue. Now they have taken an enormous turn around to analyzing the dealer’s warranty administration and business practices. Many dealers are faced with an “unfavorable” warranty trend report leading quite often to costly warranty processing audits and reviews. In fact, some dealers are changing their warranty administration by playing the “hold the claim game” or in some cases going as far as “eating claims” in order to avoid manufacturer harassment. We have all been told that warranty processing dollars were going away and dealers were told to beef up the customer pay work to compensate for the loss of revenue.